Welcome to this new edition of the SOLIDWORKS Support Monthly News, co-authored by members of the SOLIDWORKS Technical Support teams worldwide. Free Surface is one of the coolest features to be added in SOLIDWORKS Flow Simulation in years. It allows two-phase flows, like water and air or two immiscible liquids. Most people use it for water and air to simulate real-world interactions like the wake behind a boat or sloshing in liquid tanks. It’s fun to play with, and you can simulate a phenomenon like the Coandă effect. In the SOLIDWORKS Flow Simulation animation below you will see how a fluid jet has a tendency to say attached to a convex surface. 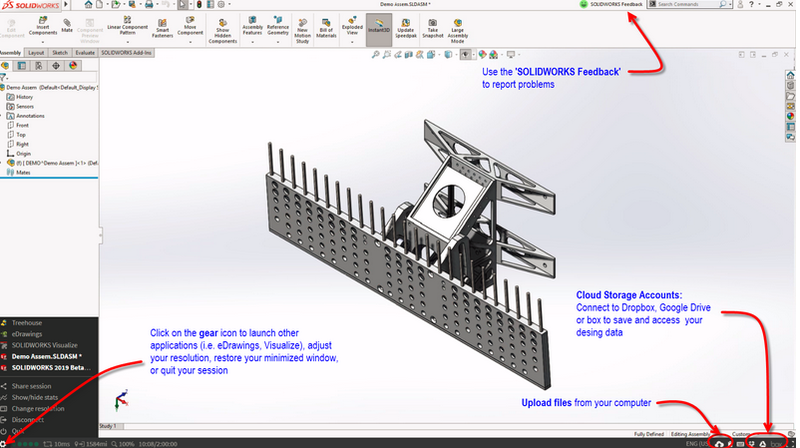 The SOLIDWORKS® 2019 Beta program provides early access to test the SOLIDWORKS software. 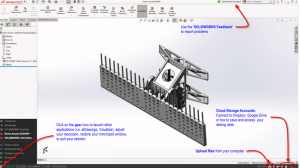 Beta testers can either download and install the SOLIDWORKS 2019 Beta software, or run the SOLIDWORKS 2019 Beta Online version for anywhere, anytime testing through the use of a supported browser. There is no need to download, install or activate any software! SOLIDWORKS 2019 Beta Online is available for the duration of the Beta evaluation period (ending approximately September 9, 2018). New! In addition to the availability of all three beta releases online, there will be intermediate bug fix updates midway between the B1 and B2, B2 and B3, and B3 and Pre-Release milestones. There are a limited number of sessions available, so give it a try today! Log into the SOLIDWORKS Beta website between now and the end of the Beta Program (approximately September 9, 2018). Click on the ‘Try Online’ link. Log in using your ‘my.solidworks’ credentials. If you need help getting started with Beta Online, please read through the SOLIDWORKS 2019 Beta Online FAQ or post a comment in the SOLIDWORKS 2019 Beta Online forum post. If you find any bugs with the available products, or if you experience any problems that prevent you from using these products as you would in a local environment, then please report these issues as Beta Service Requests (SRs) in the same way that you normally do during the Beta period (‘SOLIDWORKS Feedback’ toolbar > ‘Submit a Bug’). 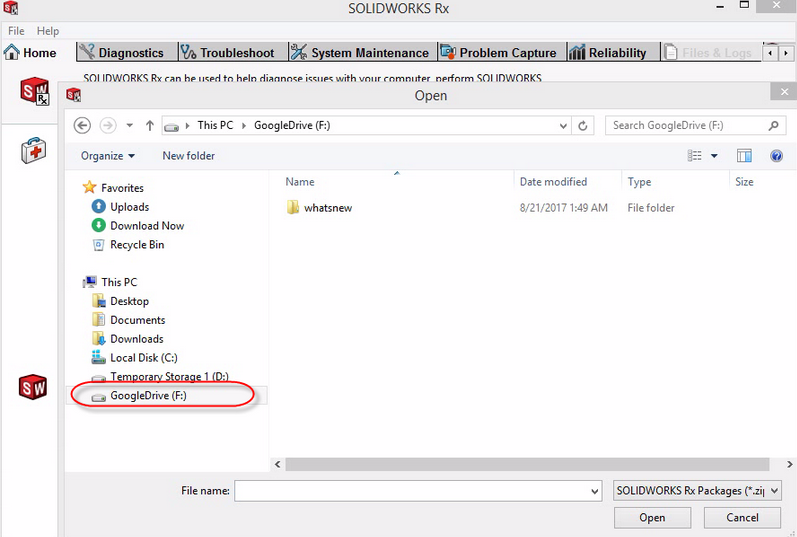 To save a SOLIDWORKS Rx capture, you must connect to an online storage account such as Dropbox™, Google Drive™, or Box™). Once connected, the cloud storage will display as a drive in which you can save files. Download your saved Rx capture and attach it to your SR.
Use the ‘SOLIDWORKS Feedback‘ toolbar to send us a quick comment. When I change machine-license activation to online licensing, why do I see the error ‘Activation type cannot be changed because more than 1 user is assigned to this Product.’? The purpose of online licensing is to accommodate an individual user who has more than one device. An online license can only be assigned to one user, see Solution Id: S-074581. 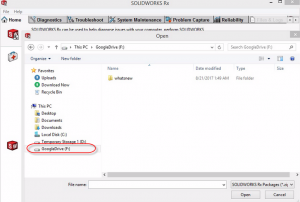 What problems can occur if use the *.MSI file to install SOLIDWORKS® Electrical instead of using the SOLIDWORKS Installation Manager? SOLIDWORKS® Technical Support recommends that you use the SOLIDWORKS Installation Manager to install SOLIDWORKS Electrical. For more information, see Solution Id: S-074531. When I log in to the SOLIDWORKS® PDM local view, why do see the error ‘Could not load file or assembly [File path]\AddRenamer_x64.dll or one of its dependencies. The module was expected to contain an assembly manifest.’? To resolve this issue, follow the steps in Solution Id: S-074508. In SOLIDWORKS® Simulation, is it possible to offload studies from multiple coordinator systems to the same worker agent system at the same time as using the Offloaded Simulation functionality? In SOLIDWORKS® Flow Simulation, which applications are most suitable for use with the free surface functionality? For more information, see Solution Id: S-074515. Sr. Technical Customer Support Engineer, SolidWorks, NAM at DS SolidWorks Corp. I have been a Tech Support engineer for SOLIDWORKS products since 2013. I now handle the SolidWorks Support Monthly News blog.